SAN DIEGO — A variety of seminars are scheduled for the weekend days of the San Diego Sunroad Boat Show, coming to Sunroad Resort Marina Jan. 24-27. All seminars are planned to take place in the Pavilion, next to the pool. The first seminar is a course presented by Capt. Pat Rains on “Cruising Mexico 101 for Sail and Power.” Capt. Rains’ program will take place both Saturday and Sunday (times to be announced later), tied into the release of her new book of the same name. The second seminar is titled, “Efficient Downwind Sailing — Setup and Trim of Asymmetrical Spinnakers.” This presentation will explore proper technique and technical advice on rigging and trimming asymmetrical spinnakers in order to promote sailing safely and efficiently sail downwind. It will be presented by Charlie Jenkins and will involve Ullman Sails of San Diego, as well as South Coast Yachts. The seminar time will be announced later. The third seminar is “Electric Propulsion for Sailboats.” Participants in this seminar will learn about the advantages of electric propulsion, meet sailors who have converted their boats to electric propulsion, meet the vendors who helped them convert their boats and meet the manufacturers of electric propulsion systems. Participants will discover how to select and convert a diesel or gasoline inboard engine to clean, green and quiet self-generating electric propulsion. The seminar leaders will discuss all-electric propulsion, hybrid diesel electric propulsion, power storage battery technologies, sizing of systems, installation issues, safety issues and advantages of electric propulsion for sailboats. Learn about the state of technology and what choices you have to power your sailboat. This seminar is presented by Electric Yachts of Southern California. The seminar time will be announced later. In addition to the seminars, San Diego’s Seaforth Boat Rentals will be offering free sailboat rides for attendees to try out the company’s array of rental boats; West Marine is planning free rides in its new lineup of inflatable boats; and rental company San Diego Comfort Cruise will be offering rides aboard its fleet of 18-foot Duffy electric boats. Boat show attendees in the market for a new vessel will want to take a look at this year’s many featured boats, including Northrop and Johnson’s display of the largest boat in the show: the 122-foot Shogun, a John Overing design built by Flagship Marine. Other boats to be presented at this year’s show will include a 62-foot Hampton and a 48-foot Maritimo from Hampton Yacht Group, a 65-foot Fleming from Chuck Hovey Yachts, 50-foot and 43-foot Mikelsons from Mikelson Yachts, a 53-foot Selene by Selene California, Beneteau’s line of sailing yachts and Beneteau’s new Gran Turismo powerboats, Jeanneau and Hunter sailing yachts, Catalina sailboats from Heritage Yacht Sales, Cruising Catamarans from West Coast Multihull, and a variety of other sailboats and powerboats 35 feet and larger. Show attendees can park in the lot directly adjacent to the Sheraton Harbor Island Hotel on the corner of North Harbor Drive and Harbor Island Drive for $10. Shuttle service will be available to and from the Sheraton parking lot starting one hour prior to the show’s opening each day and continuing through one hour after the show closes. 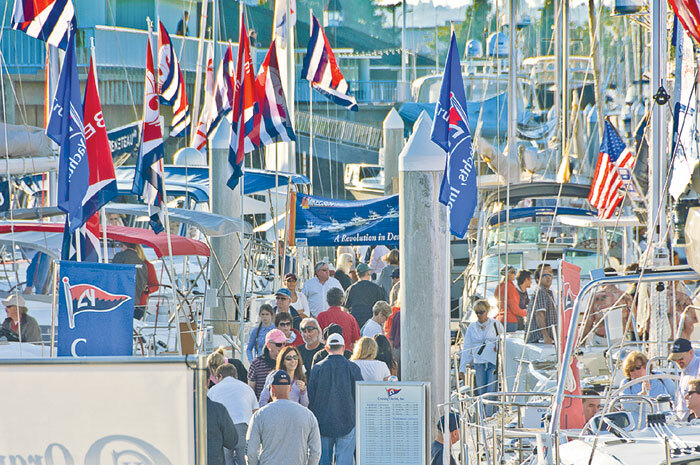 Boat show admission is $12 for adults; free for children younger than 12. Military, EMT, police and fire personnel will be admitted free Jan. 24 and Jan. 25, with proper identification. Sunroad Resort Marina is located at 955 Harbor Island Drive. For more information on the San Diego Sunroad Boat Show, call (619) 497-5254 or visit bigbayboatshow.com.